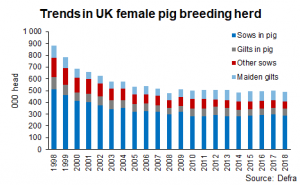 The UK pig herd increased by 1% compared to a year earlier, to 5.0 million head, according to the June Agricultural Survey figures published by Defra. Within this, there was stronger growth in England (+2%), but this was countered by declines from Northern Ireland (-2%) and Scotland (-3%). 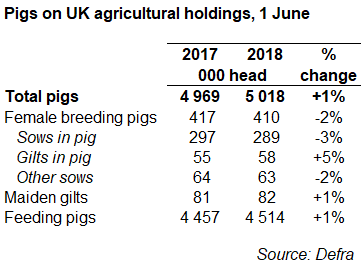 The increase in total pig numbers was driven by rising numbers of feeding pigs in June 2018, increasing by 1% compared to the previous year, to 4.5 million head. However, clean pig slaughterings in recent months have been slightly higher than these results would suggest, with 57,400 (2%) more pigs killed in July-September 2018 than last year, according to AHDB analyst Bethan Wilkins. “Trends from the June survey are typically not supported by subsequent slaughtering data, and this year’s results should again be treated with caution,” she added. 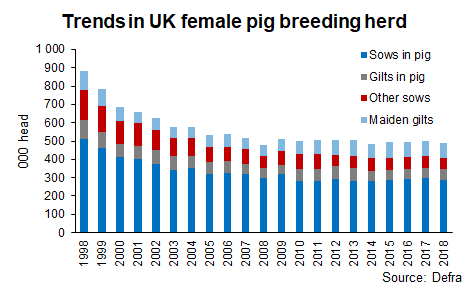 Despite the increase in the overall pig herd, the UK breeding herd showed a 1% decline to 504,000 head. Within this, the active female breeding herd recorded a similar decline to 410,000 head. “Although gilts in pig were up 5% at 58,000 head, numbers of sows in pig or suckling/dry were down 3% and 2% respectively. “However again, with unreflective trends recorded in previous years, the results should be viewed with some caution,” Ms Wilkins said. “A reduction in in-pig sows is perhaps not unexpected, given higher slaughterings of sows in the first half of the year. However, this in itself reflected an older age profile of the herd, following a low culling rate in 2017. “Finished pig prices remained above the cost of production in the first half of 2018. Reports also suggest integrated pig units have been expanding, perhaps hoping to capitalise on potential opportunities surrounding Brexit. Overall, while there is some uncertainty, AHDB anticipates that a small increase in the breeding herd may be more feasible over the past 12 months. “Production of compound breeding feed was 3% higher than a year earlier between May and July this year, supporting this notion. This is particularly the case, since feed efficiency has improved recently according to Agrosoft data,” Ms Wilkins said. “In addition, productivity gains are anticipated in general, so the supply of UK clean pigs for slaughter is expected to continue rising in the coming year. However, the hot summer will likely limit supply growth in early 2019.